Recently, a high-speed camera is frequently used to record dynamic phenomena such as a collision of cars and a flying animals. The lens of the high-speed camera needs to be bright because the exposure time of the high-speed camera is short due to its high frame rate. The bright lens, however, decrease the depth of field (DOF). DOF means the depth range of the position in focus. If the DOF is short, some part of the objects may become out of focus or moving animals may instantly go out of focus. Focus stacking is a method for extending the DOF. It synthesizes images whose focal points are at different position, and produce an image with extended DOF. To prepare such images for focus stacking, shifting the focal point of the optical system is required. However, the speed of shifting the focal point of the conventional optical system is strictly limited. In this research, we developed a new optical system with Dynamorph lens, which is the liquid lens we developed, and greatly improved the speed of shifting the focal point. By applying focus stacking to the images acquired using this optical system and the high-speed camera, we succeeded in producing 1000-fps movies with extended DOF from 8000-fps images captured while scanning the in-focus position with an amplitude of about 30 mm and a frequency of 500 Hz. Figure 1. Schematic diagram of the developed High-Speed Variable-Focus Optical System. Figure 2. Results of DOF Extension (top: images synthesized by focus stacking; bottom: unsynthesized images). 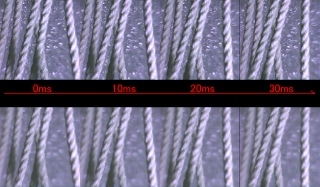 Extended DOF observation of swinging strings. Left movie shows the result without DOF extension, and right movie shows the result with DOF extension. 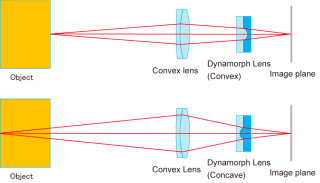 Overview of the developed optical system including the Dynamorph Lens (high-speed liquid lens), and the DOF extended movie of a rotating object. *AIP © 2009 American Institute of Physics. This article may be downloaded for personal use only. Any other use requires prior permission of the author and the American Institute of Physics. The article appeared in H. Oku et al.,Appl. Phys. Lett. 94, 221108 (2009) and may be found at http://link.aip.org/link/?APL/94/221108. *IEEE © 2006, 2009 IEEE. Personal use of this material is permitted. However, permission to reprint/republish this material for advertising or promotional purposes or for creating new collective works for resale or redistribution to servers or lists, or to reuse any copyrighted component of this work in other works must be obtained from the IEEE.